TV Jockstrap has launched a Kickstarter Campaign to raise funds and expand their product line. The 2-inch elastic strap that wraps around the TV screen and hides the sports score tickers was a great success in 2018, and feedback from visitors at the Consumer Electronics Show in January indicated the need to adapt and expand the product line. Over 59% of Americans identify themselves as Sports Fans and those millions of fans have a common problem: the scrolling score ticker on sports channels can spoil recorded games and distract fans from the live action. 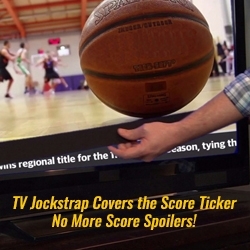 TV Jockstrap is the solution to score spoiler pollution. It is changing the way you watch sports. It is a completely unique product with no competition. Rich Pisani, Entrepreneur and President of swooshrp, LLC, first invented the TV Jockstrap for his wife who would put shoe boxes or blankets in front of their TV to block the score ticker so it wouldn't spoil recorded games. Now every sports fan wants one. - The length is customizable to fit smaller screens. At the 2019 Consumer Electronics Show in January, some of the thousands of visitors to the TV Jockstrap booth asked for some extras. 1. The ESPN score ticker has become taller. While the Original TV Jockstrap still blocks the ESPN scores on screens up to 75-inch diagonal, a thin line of their banner can appear above or below it on screens larger than 48-inches. Note: The Original still completely covers the tickers on all other sports channels on a full 75-inch diagonal screen. 2. Many, many sports fans said they would love to have the name of their favorite team on the TV Jockstrap at home or at their local Sports Bar like "Go Eagles!" or Go Warriors!" or "Go Blue Devils!" or "Go Yankees!" This team loyalty would add to their game day fun. 3. Large companies expressed interest in their logos on TV Jockstraps to sell or distribute with their products so that sports fans watching games would also see their product. 1- A 2-1/4 inch strap which will feature a newly developed and tested high-strength buckle with the same teeth-grip as the original TV Jockstrap. 2- Prototype sleeves with team or sports bar names currently available in small quantities will be commercialized with templates developed and made available to customize online. 3- Commercial logos jacquard-knit into the TV Jockstrap (not printed on after manufacture) so that stretching will not diminish the clarity or impact of the logo. - Frustrated sports fans will have another choice to hide the taller ESPN score ticker...without resorting to duct tape. - Sports bars will raise their customer appreciation because fans are often there to watch a game while they are recording another game at home. The customized sleeves give sports bars a choice to hide the tickers and promote their name. + Sports fans will have their favorite team name covering the score tickers to show their loyalty. + Retailers, beverage companies, and even the sports channels themselves can brand TV Jockstrap so sports fans who appreciate blocking the ticker are also seeing their advertising. This is an overview of the TV Jockstrap product.